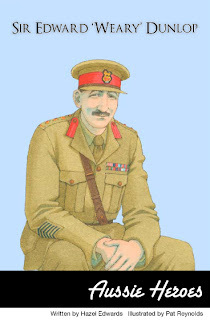 Sir Edward 'Weary' Dunlop was written by Hazel Edwards, illustrated by Pat Reynolds and published by Australian publisher, New Frontier (2011). This non fiction children's chapter book is the second book to be released in New Frontier Publishing's Aussie Hero series, with Dame Nellie Melba the first and Fred Hollows being released later this year. Hazel Edwards has chosen a man to admire in Edward Dunlop, nicknamed Weary by his University mates in typical convoluted Aussie fashion: Dunlop Tyres = tires = weary. Edwards is a talented Australian author who brings Dunlop to life for us in the book. She carefully chooses the highlights of his life, explaining them in language simple enough for children to understand, but with vivid and interesting words that make an impression. This is a children's chapter book, not a picture book, but Pat Reynolds' colourful illustrations not only enhance the story, they break up the text, making it easier for youngsters to read. The book targets children 9+, and I think it will make an excellent addition to school and local libraries looking to flesh out their Australian history collection. This Aussie Heroes series makes an excellent prompt for having children think about and write about people they admire and respect. It's important for children to read about people designated as heroes. The media makes much of celebrities who do outlandish things to gain attention, but people like Dunlop inspire and show us the rewards of dedication and hard work. Boys in particular will enjoy reading about Dunlop's sporting prowess. I hope everyone who reads the book will be as moved as I was to read about Dunlop's compassion, courage and tremendous determination during the Second World War. 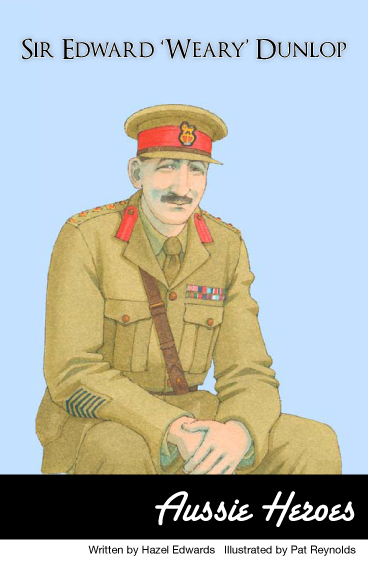 You can find resource material to support Sir Edward 'Weary' Dunlop at Hazel Edwards' own website.